Is Google Going After Seesmic? You can use Vidnik to create a video diary, or just to quickly record a video comment to attach to an existing YouTube video. 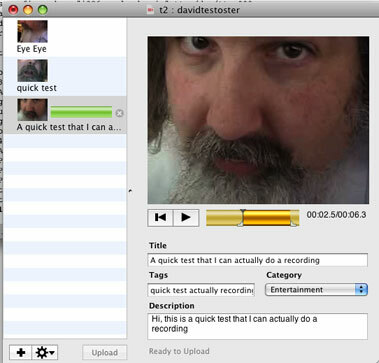 Vidnik works with the built-in video cameras on recent Macs, with Firewire video cameras, and with many USB video cameras. To use Vidnik, run the app, then click the record button to start recording. Click it again to stop. Trim to just the golden moments you want to keep, as in the screen shot above. Fill in the required title, description, and so on. Click the upload button. That’s it. Or you can drag movies made in other programs onto Vidnik’s column of movies, then click the upload button. And to use another program to do a little post-production, use the Gear menu to show Vidnik’s movie file in the Finder. Edit the movie in the other program, then upload it. In other words, it’s designed to work with your built-in video camera to make filming and uploading movies trivia – the same territory Seesmic covers. Google’s entry suggests that user-generated Internet video is going to get easier fast.